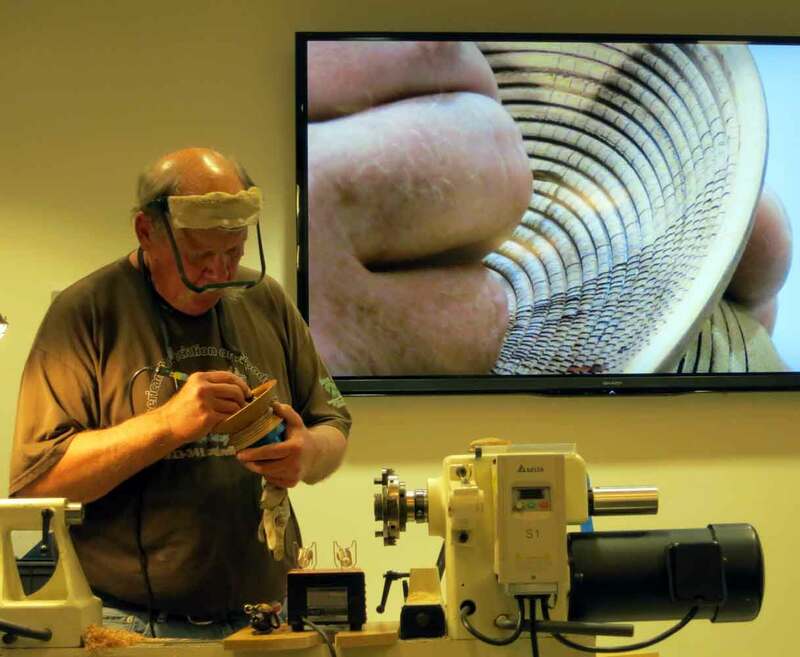 Claude Godcharles & Dennis Lillis will explain sharpening followed by a hands-on workshop. Bring your difficult tools and learn to sharpen them correctly. We will need additional grinders, please let us know if you can help. This guy is good! Don't miss this demo. See his website here. This is an important club function. See below. June meeting: Bob Bley will cover stone inlay. July meeting: Corwin jones will demonstrate his method for sphere. Bob creates the illusion of woven baskets through a process of design, drawing, burning and coloring. Bob's designs are variations on Indian basket themes. 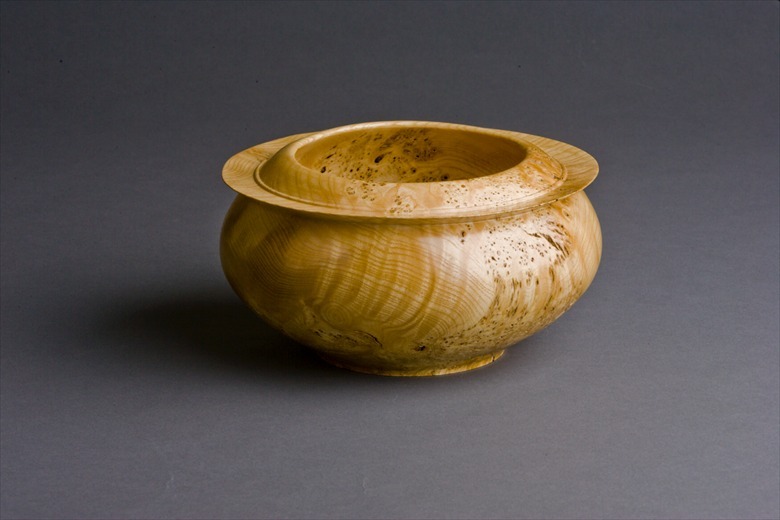 Starting with a finished turning, he draws carefully spaced circular and radial lines while on the lathe. He then burns the lines on the lathe and by hand. Careful coloring of the spaces between lines creates the desired pattern. Wow! The finished piece looks like a real basket and a beautiful one at that. This is our annual event where we can show our stuff. 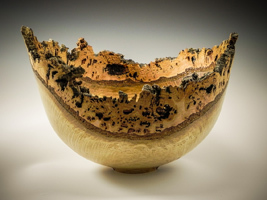 We show by having a competition and by demonstrating the art and craft of woodturning. The success of this depends on your participation. If you are interested and will participate let Dave Vannier know. If not, also let him know. This information is crucial to the planning. I would like to talk about club communication and demonstrators. Myself, I am an email person. I do text, but find I am not easy to get on the phone. I refuse to have a phone in my shop. The last think I want to do is jump while I am working. It could cause a really bad accident. So, I am hard to get on the phone. You can leave messages, and assuming I remember to check, I'll call back. I used email extensively at work, so I'm very comfortable with it. Several years ago our club president reminded me that we are a wood turning club, not computer club. At the time, around half of our members were on email. Today, essentially all of us are. I sent out an email after the last club meeting, and frankly the response was extremely small. So, this is a test. If you are reading this, please send me an email at dsvannier@yahoo.com . Tell me what your preferred form of communication with the club is. We have been discussing the yahoo groups and our club web site. It appears possible to migrate to the club website for everything, but means a lot of work for Tom Haines. I'm reluctant to ask him to do all that work unless we really are going to use it. So, I would like to hear your thoughts. We have a demonstrator coming in May, Jason Breach. We are lucky to be catching him after he demonstrates at the Utah Symposium. I make it a point of going to all of these that I can. Unfortunately I will miss this one. I want to encourage everyone to attend. The demo's that we put on are very inexpensive relative to the alternatives. I've attended several Utah & AAW symposiums. For me, learning new things, new techniques, or just finding new inspiration is worth the time and money. But the club demos are practically free! I've heard people in the past say things like "I'm not interested because I will never turn xxxx." Or "I can get all the information on a YouTube video, why so I waste my time?" The first question is easy to answer. We had JoHannes Michelsen demonstrate making wooden hats, followed with a hands on class making hats. I've turned a few hats, just to get one "right". But the one thing he taught us was how to turn thin, really thin. And that applied to a lot of turnings, not just hats. The people that did not go, really missed out. I've watched a lot of videos, and yes they are good. You can learn a lot, but I've never been able to ask a question and get an answer to a question that I had. It is better than nothing, but far from the real thing. So, think about it. If you can make the demo's and you want to learn and expand your skills, plan on making it a day. An archive of past meetings is available on the website under menu selection "Meetings" - "Past Meetings". Or click here. These date back to May 2012. 2015 WBW board members and committee chairs.